Russian paratroopers successfully landed on a drifting block of ice in the Arctic Ocean for the first time in history, Russia's Defense Ministry reported. The troopers also carried freight containers to set up base in direct proximity to the North Pole. According to the Ministry, paratroopers from the Ivanovo and Pskov airborne divisions carried out the first ever mass paradrop on a drifting ice floe close to the North Pole, within a joint mission with a contingent from the Collective Rapid Reaction Force of the Collective Security Treaty Organization. Despite adverse weather conditions and poor visibility, the troopers successfully landed on ice-covered waters. They were also carrying freight containers of up to 50kg (110lb), with everything necessary to operate in the region's harsh weather conditions. 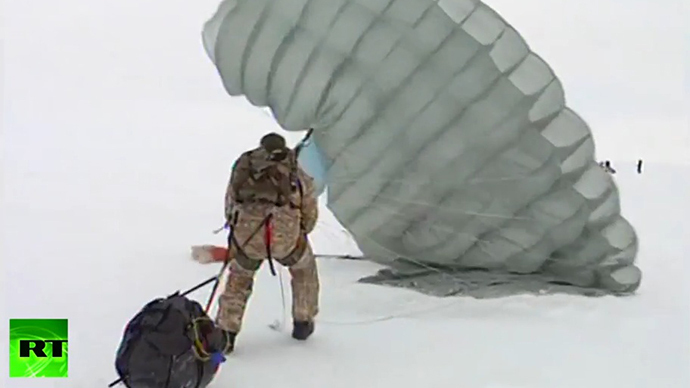 After setting up camp in minus 50 degrees Celcius (-58 F) and deploying communication equipment, the paratroopers started their first legwork towards the North Pole, where a training humanitarian search and rescue expedition will be carried out, the Defense Ministry reported on Wednesday. No off-road vehicles are used in the mission, with the troopers only using snowshoes and skis, the ministry added. In the open water areas the troopers will have to set up bridge or swim in special immersion suits to reach another iceberg.